Princesses Beatrice and Eugenie pose before Brandenburg gate. 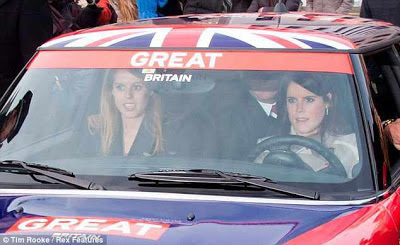 It seems Princesses Beatrice and Eugenie are having a great time driving around Berlin and promoting everything "Great" about Britain. The two Princesses are now in the German capital to embark on a year-long campaign in their capacity as Britain's trade ambassadors, a position recently held by their father, Prince Andrew. "They flew to the German capital to support the Great Campaign, a global initiative to attract visitors, business and students to these shores," reports Telegraph online. Their Berlin trip was highlighted by a "mini" drive-through in Berlin. 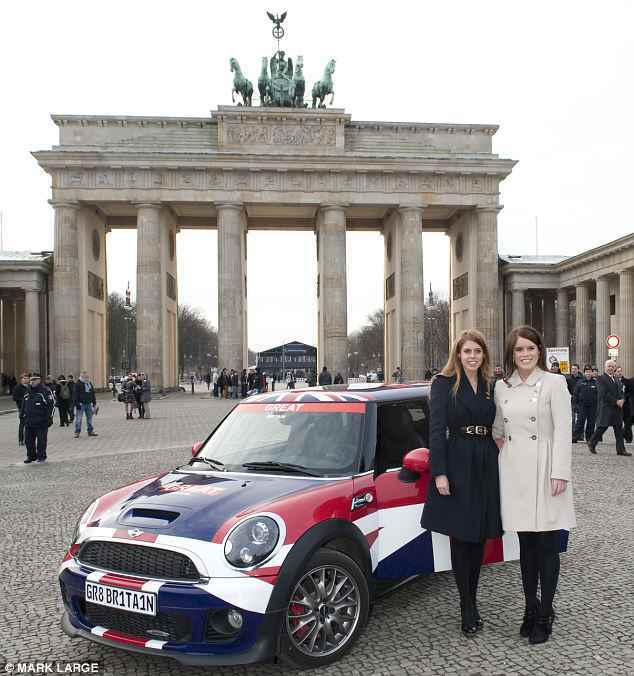 After posing in front of the Brandenburg gate, 22-year-old Princess Eugenie of York drove the Union Jack emblazoned-car heading to the British Embassy nearby. ''The Great Campaign is designed to showcase the very best that we have to offer," 24-year old Princess Beatrice of York said on a short speech. ''2012 is already a year of amazing memories - but as 2013 begins we've got so much we'd love for people from around the world to come and enjoy - beautiful countryside; lively cities; and some of the world's most incredible museums and hundreds of unique historic places," she continues. ''The Great Campaign also has a serious business side - Britain has trend setting fashion, groundbreaking scientists, and innovative technology companies.